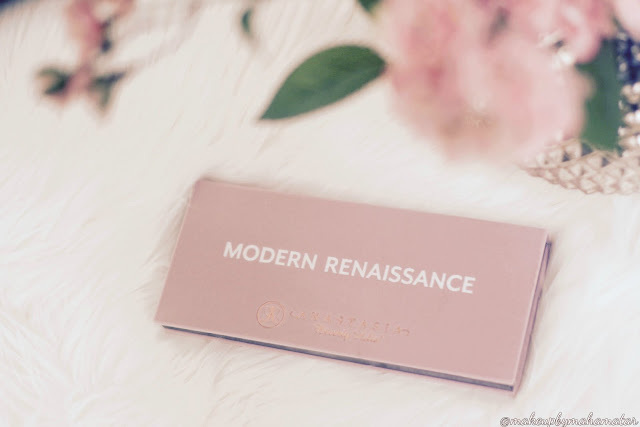 I finally had to chance to grab the highly hyped up Anastasia Beverly Hills Modern Renaissance eyeshadow palette. 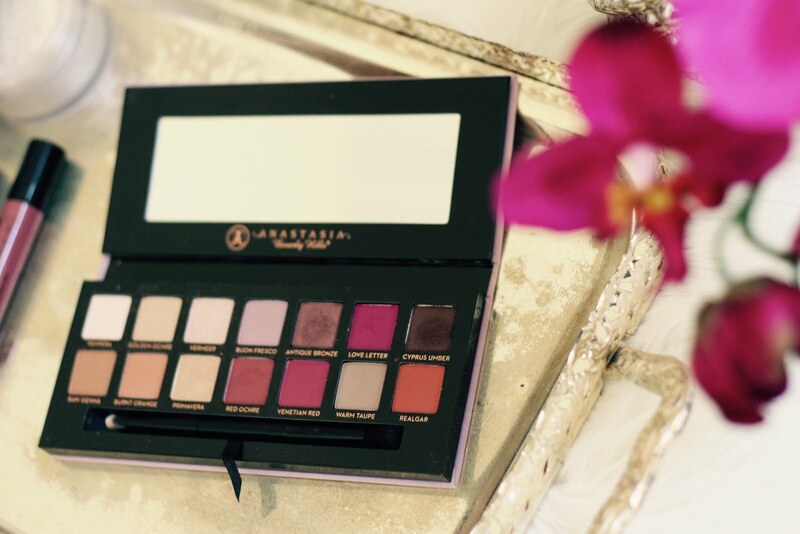 This palette is comprised of 14 shadows with mostly matte and a few metallic shades in neutral and berry tones. You have a mix of vibrant red, pinks,oranges and browns. The variety is just fabulous! The palette itself is vanity display worthy!. It’s a pink/lilac velvet compact that looks very regal and has the Anastasia Beverley Hills logo in the middle. The shadows are .02 oz each and were produced in a cruelty free environment. The palette also comes with a well constructed dual ended brush. Bonus! I ‘ve ben wearing this palette now for over 2 weeks straight and my favourite combo at the moment is Antique Bronze + Love Letter + Venetian Red + Warm Taupe. I didn’t think I would be a fan of the berry tones but I’ve been converted! How great is it to have neutral matte shades( taupes and browns) in the same palette as matte oranges and reds! 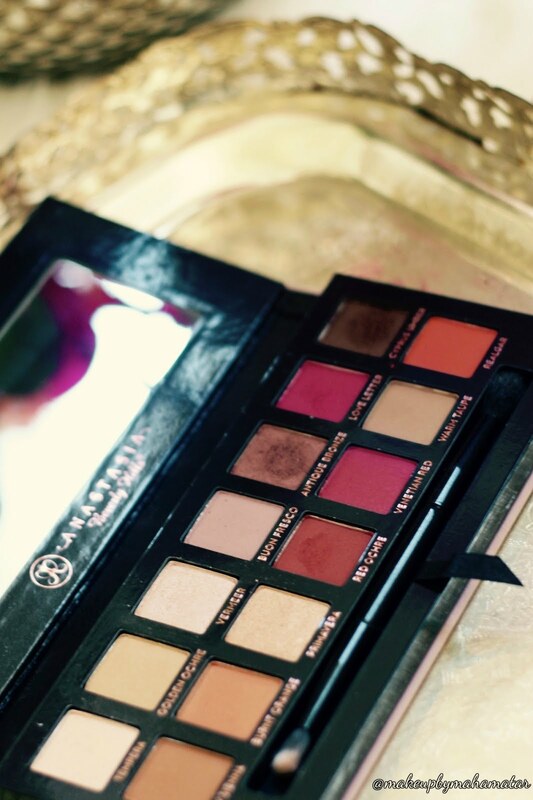 This palette is feminine and romantic but most importantly wearable! Because they’re matte shades you can layer them on until you find the intensity and combo of colours you’re comfortable wearing.You can apply these shadows with a light hand for day /work wear or heavy handed for a night out. The shadows themselves applied very well with little to no fall out. They went on smoothly and layered well. Out of the 14 shades my absolute favourite is Red Ochre! I love applying it on the outer crease to add a bit of drama to my daytime look! Gives me just enough “pop” for day wear! Tip: You can spray MAC Fix + on your brush and dip into any shade to make it more vibrant if you wish. Overall I’m really impressed with this palette. I was hesitant at first because I wasn’t in love with my very first Anastasia palette that I purchased awhile back. I felt it had crazy fallout and poor pigmentation of the shadows, however, I feel this brand has come a long way with their eyeshadows since my last ABH shadow purchase and they are becoming a force to be reckoned with if they continue to be innovative with colours and combos in their palettes. Amazing palette ABH! Worth the Hype? 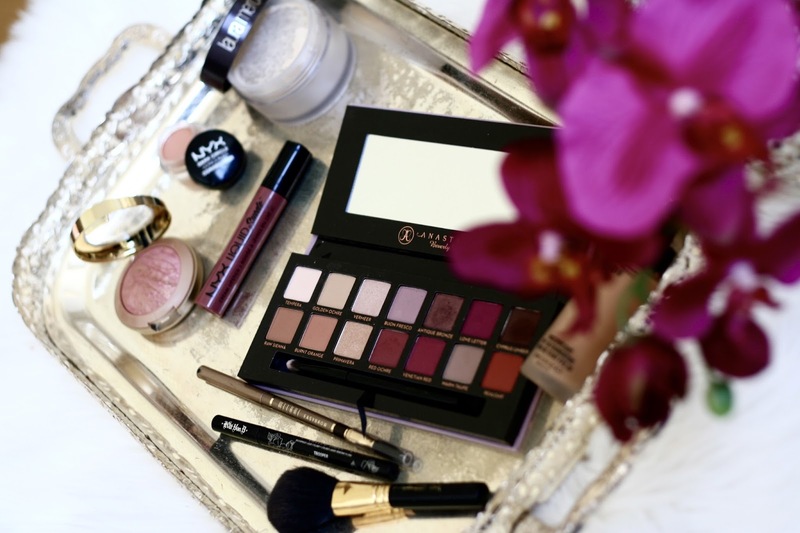 Yes it is beauty lovers!If you’re shopping around for a palette with a variety of warm bold and neutral shades, go ahead and give this one a try. DISCLAMIER: I was not compensated for this post. I bought the palette with my own money.The opinions expressed are my own. AMAZING PIXI BY PETRA SKIN CARE PRODUCTS THAT WORK!